1600 Pennsylvania Avenue-the White House-is an address known around the world. It's the residence and primary workplace of the President of the United States. Today, the building is owned and administered by the US National Park Service. 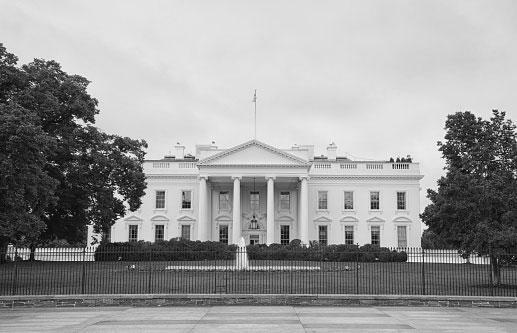 The White House has gone through many changes throughout its over 200 years, including its name. It was formerly known as the President's Palace, the President's House, and the Executive Mansion. Construction on the elegant white edifice, designed by Irishman James Hoban began in 1792 after Washington, D.C. was designated as the nation's capital. Construction took eight years and the basic structure was completed in 1800, in time for President John Adams and his family to move in on November 1 of that year. Like the Presidency itself, the White House continues to evolve. The building has survived two major fires-the first during the War of 1812, and a later one in 1929 during the Hoover administration-and dozens of remodeling efforts. Throughout the years, features like central heating, electricity, indoor plumbing, and central air conditioning were added. Few people realize that the White House is as large as it is. The structure has six stories and over 55,000 square feet of floor space. There are 132 rooms and 35 bathrooms in the structure. There are 412 doors, 147 windows, 28 fireplaces, eight staircases, and three elevators. There is a staff of five full-time chefs, which enables them to serve dinner for up to 140 guests and hors d'oeuvres for more than 1,000 guests. When it was built, it was the largest home in the United States, an honor it held until after the Civil War. The President's private living quarters include sixteen rooms on two floors. The house has three kitchens, a bowling alley, an outdoor swimming pool, jogging track, tennis court, billiard room, and a movie theater. The White House contains an important fine art collection. There are Presidential portraits, such as the famous, life-size Gilbert Stuart painting of George Washington, the oldest painting in the White House. First Lady Dolley Madison saved the huge painting when the British torched the house during the War of 1812. The collection is filled with works by American masters, such as Mary Cassatt, James Whistler, Georgia O'Keefe, and Childe Hassam, as well as European painters, such as Paul Cézanne and Claude Monet. The West Wing has become synonymous with presidential power. It houses the President's senior staff, including the Communications Director, the President's Chief of Staff, and the White House Press Secretary. This portion of the mansion also includes the President's Oval Office, the Cabinet Room, and the White House Situation Room. The West Wing was added to the building in the early 1900s to accommodate the growing Presidential staff that was crowding the President's living area. The addition was expanded during Franklin Roosevelt's administration, and Roosevelt's indoor swimming pool was converted into the Press Briefing Room during Richard Nixon's presidency. Added in 1942, the East Wing was the last major addition to the presidential residence. In July of that year, Franklin D. Roosevelt had the East Terrace Cloakroom converted into a movie theater. During the Reagan Administration, the theater underwent some remodeling to include 51 seats in tiered rows. A more recent refurbishment in the 2000s was inspired by early 20th century movie theaters. Today, the East Wing houses the First Lady's office and staff as well as a host of other staff offices. And, for the first time, visitors to the White House can see the theater. In May 2017, First Lady Melania Trump made the decision to open the theater to visitors who take the self-guided tours in the East Wing. Theodore Roosevelt first called it the White House in 1901. James Hoban rebuilt the White House after the fire burned it to the ground in 1814. After adding book-ending terrace-pavilions and water closets, Thomas Jefferson was the first to hold an inaugural open house in 1805, and subsequently offer public tours on New Year's Day and 4th of July. James and Dolly Madison decorated the house with extravagant French furniture. John Quincy Adams established the first flower garden. William Taft hired architect Nathan Wyeth to expand the executive wing in 1909, which created the Oval Office. Architect Eric Gugler doubled the space that was starting to become known as the "West Wing," including a swimming pool and moving the Oval Office to the southeast corner. Harry Truman's era saw a major overhaul due to long-standing structural problems, and they helped redesign many of the state rooms and decorate the 2nd and 3rd floors. The White House is the only private residence of a head of state open free of charge to the public. 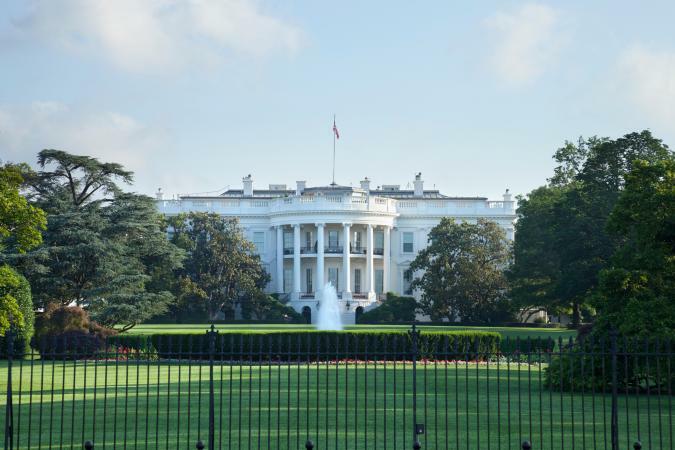 While it might seem like fun to visit the White House on a random day while touring Washington, D.C., the truth is you need to plan this visit far in advance. For US citizens interested in visiting the White House, you must submit a request through a Member of Congress. Requests can be submitted up to three months in advance and no less than 21 days in advance. Visits are scheduled on a first come, first served basis, so it's important to submit your request early as they are limited to a small group of people. If you're not a citizen of the United States, you'll need to contact your embassy in Washington, D.C. for assistance in submitting a tour request. Unfortunately, it's noted that some embassies have indicated they are not able to assist with White House tours, so it may take some additional research to get the approval. Self-guided White House tours are available Tuesday through Thursday from 7:30am to 11:30am, and 7:30am to 1:30pm on Fridays and Saturdays, excluding federal holidays, or unless otherwise noted. Tour hours may be extended when possible based on schedule, and tours are subject to last minute cancellations. Expect to spend about 90 minutes to complete your tour. US citizens must present a valid, government-issued photo identification, while foreign nationals will be required to bring their passport. Other types of ID are not accepted. All the information submitted on your request must match your government-issued photo ID exactly. This information must include your name, date of birth, city, and more. As of July 2015, you can bring in smartphones and compact cameras with a lens no longer than three inches on the public tour route, provided they don't interfere with guests' enjoyment of the tour. 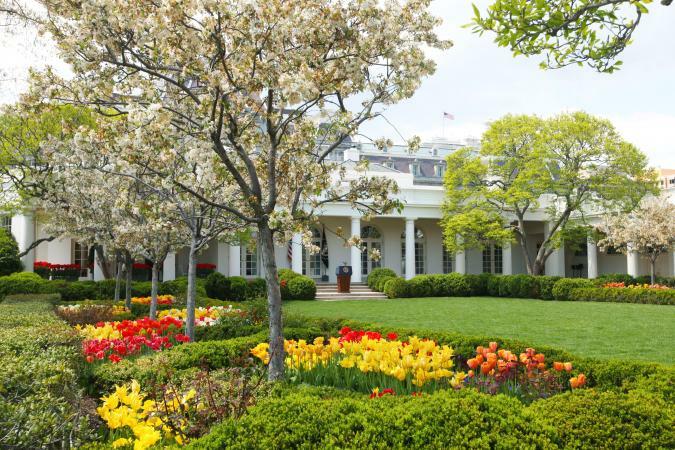 Twice a year, over weekends during spring and fall, visitors can partake in a White House Garden Tour. Visitors will be allowed to visit the Jacqueline Kennedy Garden, Rose Garden, White House Kitchen Garden, and the South Lawn. If you're interested in souvenirs, you'll need to order them online through the White House Gift Shop's website. The Easter tradition started when young kids would come to Capitol Hill on the Monday after Easter for a day of fun and egg rolling. Congress grew annoyed with crowds and passed an Act of Congress that put a stop to the egg rolling. The event was moved to the White House in 1878 and became an annual tradition. The event grew larger every year and was first broadcast to a national audience in 1933. President Nixon invited the Easter Bunny to partake in the annual event while President Reagan started the tradition of the egg hunt. To attend what has become the biggest event held at the White House, you'll need to enter the lottery for a chance at free tickets. Check the page on Recreation.gov for more details on the next upcoming lottery. While you can drive around Washington, D.C., there is no on-street parking near the complex. Public transportation is highly recommended; the closest Metrorail stations are Federal Triangle, Metro Center, and McPherson Square. 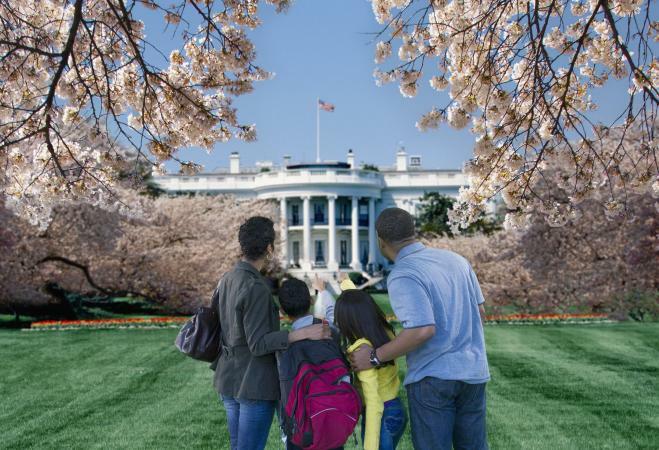 Even if you couldn't snag a spot on one of the self-tours, it's worth at least going by and seeing the White House in person, as it's not only a beautiful building, it's one of the most important historic and cultural icons in America.